We are committed to serving healthy and delicious vegetarian meals to feed the body and soul. CONSCIOUSNESS-BLOSSOMS is a locally owned vegetarian restaurant inspired by our meditation teacher, Sri Chinmoy. We come from various cultural and religious backgrounds and are grateful to find ourselves walking together on this path of love of God and service to humanity. Our goal is to offer you a unique dining experience of an excellent meal and in which harmony, joy and inspiration are felt from the moment you walk in the door until long after you leave. We believe that harmony and oneness begin in the heart of each individual and we seek to nourish that spirit by offering delicious food prepared with love. Other restaurants owned and operated by students of Sri Chinmoy can be found in cities such as New York, San Francisco, San Diego, Seattle, Chicago, Montpellier, Toronto, Ottawa, Kyoto, Oslo, Reykjavik, Zurich, Salzburg, Augsburg, Zlin, Sofia, Adelaide, Auckland, Christchurch and Volgograd. Our restaurant is inspired by Sri Chinmoy (1931-2007), our meditation teacher, dreamer of world-oneness, musician, author, artist and world-record athlete. 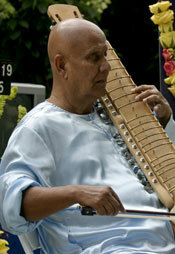 Sri Chinmoy (1931-2007) was born in Bengal, India and at the age of 12 entered an ashram (spiritual community). His life of intense spiritual discipline included meditating for up to 14 hours a day, together with writing poetry, essays and devotional songs, doing selfless service and practicing athletics. While in his early teens, he had many profound inner experiences and attained spiritual realisation. He remained in the ashram for 20 years and in 1964 came to New York City, following an inner calling to serve aspiring seekers in the West. Sri Chinmoy taught the “path of the heart,” which he felt is the simplest way to make rapid spiritual progress, as it enables the seeker to discover his or her own inner treasures of peace, joy, light and love. Never did he charge a fee for his guidance of approximately 7000 students worldwide, nor for his frequent lectures, concerts or public meditations. Between 1989 and 2004, he came to Tampa Bay five times to offer musical concerts attended by over 10,000 people. For over 43 years, since he arrived in the U.S. from his native India, Sri Chinmoy forged one of the most remarkable life stories of our time. From the inner inspiration of his meditations came a vast outpouring of literature, musical compositions, art, athletic activities and programs that continue to foster inner harmony and oneness in our world-family. In a humble manner, he worked selflessly and tirelessly, inspiring thousands of individuals throughout the world to offer their own unique service to humanity. 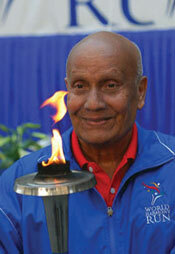 He was the founder and director of the worldwide Sri Chinmoy Meditation Centres, with branches in over 300 cities; as well as the Oneness-Heart-Tears and Smiles, a humanitarian organization serving the less fortunate in over 125 countries around the world; and the Sri Chinmoy Oneness-Home Peace Run, an biennial global torch relay in which communities in over 100 countries pass the flaming Peace Torch from hand to hand. Every other year, the US Peace Run Team runs through all 50 States – over a period of 4 months – and draws the enthusiastic participation of countless Americans, from school children to local officials. 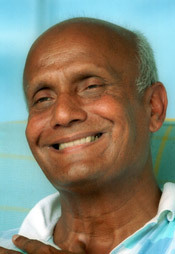 He was the founder and director of the worldwide Sri Chinmoy Meditation Centres, with branches in over 300 cities; as well as the Oneness-Heart-Tears and Smiles, a humanitarian organization serving the less fortunate in over 125 countries around the world; and the World Harmony Run, an annual global torch relay in which communities in over 100 countries pass the flaming Harmony Torch from hand to hand. Every other year, the US World Harmony Run relay passes through all 50 States over a period of 4 months and draws the enthusiastic participation of countless Americans, from school children to local officials. Sri Chinmoy devoted his life to the highest, most challenging and most urgent task facing humanity: the establishment of world harmony and oneness as a living reality. He was never daunted by the magnitude of this goal and dedicated himself with boundless energy, enthusiasm and faith to the inherent goodness of humanity. © 2019 Consciousness-Blossoms | Vegetarian And Vegan Restaurant | Tampa Bay.